Today we’d like to introduce you to Kimberly Lewis. The Friends of Oleta River State Park (Friends) is a nonprofit (or CSO, citizen support organization) incorporated in 2000 to support Oleta River State Park (Oleta). We volunteer, lead projects, and fundraise exclusively for our namesake park. In 2015, with a new board in place and a new president committed to working as a full-time volunteer, we launched out on a more ambitious and energetic path. Most of the board remains in place today and, as an all-volunteer nonprofit, this has meant the giving of significant volunteer time, energy and resources consistently to Oleta for more than two years. Our team consists of nature and outdoor recreation lovers, however, at the outset, we noticed that Oleta needed more attention given to the protection and restoration of natural resources and habitats, along with projects to better educate parkgoers on these values. Thankfully, over the last few decades, Miami-Dade County and DERM have completed many large, impactful restoration projects at Oleta. Yet, today, much of the park is still dominated by invasive and exotic plant species, limiting ecosystem services and wildlife. Oleta also experiences systemic problems of trash left in vulnerable coastal parkland – on the shorelines and in fragile mangrove habitats. We wanted to address this issue head on, given that most ground litter is made up of harmful plastics and glass. From 2015, we quickly worked hard to grow our community of volunteers and stakeholders in support of two core projects to: 1. revitalize a large, overgrown butterfly garden with more native plants and trees and 2. lead consistent litter cleanups. The local community’s connection to Oleta largely stems from its natural resources, such as the fringe mangrove forests and spectacular views of Biscayne Bay, providing a stunning green oasis for outdoor recreation on land and sea. Oleta Park management implements a strict set of top-down, standard parameters and tasks linked to the recreational side of Oleta, as a high-traffic, urban park. From our thousands of hours spent at Oleta and speaking to the public, we defined targeted, value-added goals, which take a more granular approach to better protecting natural spaces, while enhancing Park guest offerings. Our projects envision better management of areas often imperiled by high foot and recreational traffic (via the protection and boosting of natural resources) but we strategically work to improve Oleta for all as we strengthen the Park’s ecosystems, sustainability, and resilience. We target and clean up the plastic bottles and bags at the water line before they pollute our aquatic life. We remove critical invasive, which imperil ecological functions, and build gardens full of life by deliberately sustaining birds, bees and butterflies with synergistic native plantings. Our projects follow the objectives of the current State-approved Oleta Unit Management Plan (2008), focusing on prioritized natural-resource related tasks, for which the Park does not have funds or staff committed. Our work has resulted in meaningful achievements, to include significant strides in planting new native trees and plants and removing large quantities of the most-critical invasive plant species. We have worked hard to forge and build community relationships to support our projects running the gamut from local schools and teachers, nonprofits and small businesses to corporations, governmental agencies and offices and our neighboring university, Florida International University (FIU). After more than two years of rallying many hundreds of local volunteers to our volunteer events, we have replanted and revitalized the once overgrown and invasive-filled butterfly garden and we are now working to restore an invasive filled 1-acre of Oleta parkland with a second biodiversity-butterfly garden and urban greenspace. In the last half of 2017, we hope to add educational signage, interpretation boards, and other eco-informational features to our main butterfly garden, while continuing to restore the second garden space with more native trees, wildflowers, and grasses. Alongside our native plantings of thousands of new trees, shrubs and wildflowers, we have removed many thousands of pounds of litter and waste from Oleta parklands and initiated a recycling program at Oleta. 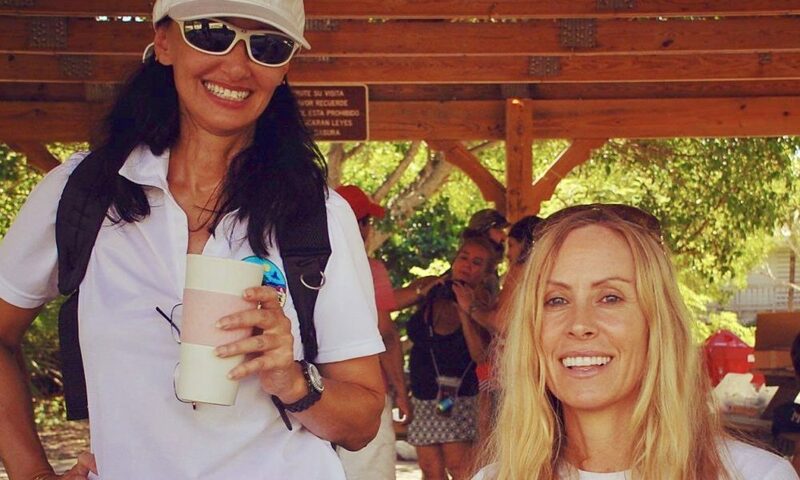 On the recreational side, two board members also lead a volunteer group, the Oleta Trail Blazers, who manage and enhance Oleta’s 16 miles of mountain bike trails. Generally, in light of the inherent challenges of running an all-volunteer not-for-profit organization, we have had a remarkably smooth road thanks to an amazing community of volunteers and a dedicated Board, whom have made any struggles ultimately bearable in contemplation of the endless generosity and selfless commitment they (we) collectively represent. Our biggest struggles directly correlate to our biggest successes, which is a great benchmark. Positively, we have been overwhelmed with volunteer support and also found many generous native plant donors. However, while native plants are drought-resistant and powerful in providing eco-system services, they do need water inputs for the first few months of establishment. We suffered initial plant losses when we realized Park management had not envisioned any watering or water provision for newly-donated native plants to Oleta. We struggled to find some form of partnership with Oleta in resolving the water shortfalls in order to honor the value of these donations and make sure the plants were successfully able to thrive to bring great benefits to the Park. In response, to avoid plant and donor losses, our volunteer teams came together quickly to brainstorm and leverage the Park to support us, given the value of our labor and time towards building a better and healthier Oleta… Using an old shower water outlet, we were able to create a volunteer-run watering system and our garden is now flourishing. We are fortunate to have received outside business support for water at our second managed garden greenspace. While periods of heat and drought can make it tough to always have the volunteer labor to meet unexpected challenges, overall, we have managed to beat the odds. Bringing recycling to Oleta was also an over two-year struggle. Recycling was seen as extra work for Park management and not feasible at a busy urban park at Oleta. For years, the Friends collected recycling at events and would dispose in our own personal recycling bins. Exasperated at the volume of plastics, aluminum and glass – bags, bottles, cans, sharp fragments, etc – we decided in 2017 to launch a Recycling Pilot with our core student committee – the Young Friends of Oleta – who have led the pilot and, to date, done most of the unpleasant work related to emptying bins, especially when they have been contaminated with food and smelly bottles. After four months of working hard each week, emptying the donated Friends recycling bins, we were able to convince Oleta to add two recycling dumpsters to support recycling at the Park. Today, Oleta is recycling with continued support from the Friends. We empty the 5 Friends bins one to two times per week and hope to expand the program with more bins as we educate parkgoers. Alright – so let’s talk business. Tell us about Friends of Oleta River State Park, Inc. – what should we know? The Friends lead several monthly volunteer events to move our projects forward and to fundraise in support of our annual budget. In 2016, about 94% of our yearly volunteer hours were focused on our two biodiversity-butterfly garden restoration projects. In this regard, volunteering has ranged from new native plantings, garden maintenance, invasive removal, leading a student-volunteer-featuring/performing seaside fundraising concert, trash cleanups and recycling drives, and public outreach to support all these activities. We work at high efficiency, keeping our project expenses at a minimum. About 40% of donated funds went directly to the park and park management for new equipment and equipment repairs and our combined project budgets were only 29% total, including both gardens and the management of 16-acres of mountain bike trails. In 2016, the Friends gave over 10,600 volunteer hours to Oleta, which is valued at over $240,000, based on Florida’s value of volunteer service per-hour rate. We have planted over 2,200 new native plants, trees, shrubs, and wildflowers and removed many more thousands of invasive weeds, plants and seedlings. Given the many tasks we must complete, partnerships are fundamental to achieving our goals. Many of our volunteers are local students and their families – the kids, collectively known as the Young Friends of Oleta, have been a great driving force towards our success. Our local Sunny Isles Beach Girl Scout Troop #460 embraced our butterfly garden as their Silver Award project and donated many hundreds of hours to the garden in 2016. They are still involved today with their troop leader as a board member. Starbucks has been generous in lifting our events with free coffee and reusable cups. For our gardens, they provide natural, nutrient-rich recycled coffee grounds and have joined volunteer events. Whole Foods has been pivotal via donated funds from the 5% day program and a plant sale, along with volunteering and the donation of two rain barrels. We use the installed rain barrels to capture rainfall to water part of our garden, with the hopes of adding more. The city of North Miami Beach has provided key support and resources for our second urban garden space by helping us launch the project and partnering us with SFM Services, who provided labor, equipment and about 100 native shrubs and trees to launch this project on Arbor Day in 2016. Opulence International Reality has donated many plants and trees and the local Kiwanis chapter has led events with us bringing donated plantings. Finally, FIU SEAS has been our steadfast partner in our one-acre Oleta urban greenspace project, in planning, leading events, providing tools, donating plants, and much more. We are proudest of the character and content of our volunteers. Each unique in talents and energy, which when brought together like a rich tapestry of vibrant threads, results in a colorful, unstoppable force towards improving our community and Park – ecologically, socially, educationally, and recreationally. They prove each day that community-based teamwork and action can be very impactful towards overall good and goal achievement. Again, we believe it is the dedication, consistency and talents of our volunteers that set us apart from others. They show up week after week and year after year to inspire others and constantly grow the Friends members and stakeholders. The characteristic, which has been most pivotal to the Friends success, is heart. As volunteers, “having heart” is fundamental and, in “having heart”, dedication, commitment and consistency are secured. Heart also pushes us to surpass any short-term obstacles and shoot for the moon in goals, knowing that creating a healthier and more vibrant local State Park will ultimately affect millions of our community today, tomorrow and into the future.